Servers | KGS | What happened with RoseDuke's style? What happened with RoseDuke's style? I was suprised to see RodeDuke's game on KGS. Recently he often plays on Tygem instead. Also, he changed his fuseki! In the past it was typical to see 6-4 and 5-5 stones in his games. Koreans proved that these corner stones are bad :) so, Victor returned back to classic things. RoseDuke [8d]: if you just make two eye for your group, my cut in center does not work. He is only half-joking. Of course nobody can say 5-5 is bad for sure, but Korean pros are such good fighters they often end up with a better result. Are you joking, or is the current professional consensus that moves like 5-5 are definitely bad? At the start of the game they were 8d and 7d, at the end, they had swapped ranks. 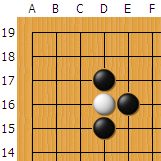 maybe i'm too noobish to read this, but wouldn't w j18 now at the end rescue white and even kill the black center group?